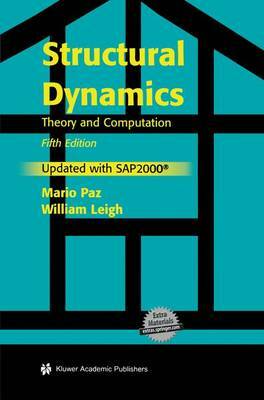 "The Fifth Edition of Structural Dynamics: Theory and Computation is the complete and comprehensive text in the field. It presents modern methods of analysis and techniques adaptable to computer programming clearly and easily. The book is ideal as a text for advanced undergraduates or graduate students taking a first course in structural dynamics. It is arranged in such a way that it can be used for a one- or two-semester course, or span the undergraduate and graduate levels. In addition, this text will serve the practicing engineer as a primary reference. The text differs from the standard approach of other presentations in which topics are ordered by their mathematical complexity. This text is organized by the type of structural modeling. The author simplifies the subject by presenting a single degree-of-freedom system in the first chapters, then moves to systems with many degrees-of-freedom in the following chapters. Finally, the text moves to applications of the first chapters and special topics in structural dynamics. New in this Edition:Problems reworked for SAP2000 ®.Step-by-step examples of how to use SAP2000 ® for every application of structural dynamics.Inclusion of companion Web site (extras.springer.com/2004) with three learning aids: SAP2000 ® student version; source code for the author's educational programs in structural dynamics, so that the results of changed parameters can be seen step-by-step; and the compiler (executable files) for the author's educational programs.Three earthquake engineering chapters updated to the latest ICC ® building codes.Materials rearranged so that theory and dynamic analysis precede applications and special topics, facilitating using the book sequentially.Complete instructions provided to advanced topics as foundation for further study.This text is essential for civil engineering students. Professional civil engineers will find it an ideal reference."